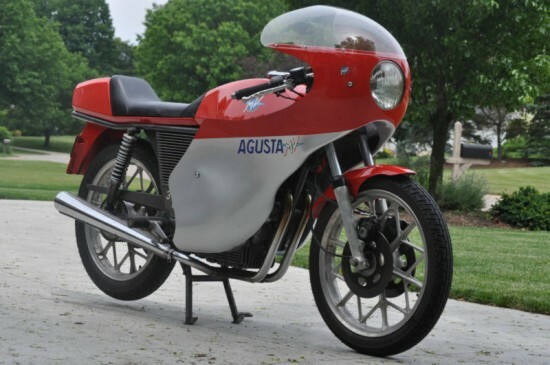 MV Agusta is certainly familiar to people who buy expensive, Italian garage jewelry and fans of fragile, price-no-object track tools. They’re also familiar if you’re a fan of vintage motorcycle racing. But MV also has a history of small-displacement sporting machines that they’ve been tapping into more recently, a line of simpler machines that could be bought and ridden by ordinary folks with a desire for elegant transportation on a realistic budget. First shown in Milan in 1973 and produced between 1975 and 1977, the 350S Ipotesi [“Hypothesis”] was styled by the famous Giorgetto Giugiaro father of the original Lotus Esprit, Maserati Ghibli, and countless other icons. The Ipotesi featured a strong, angular style that mirrored Giugiaro’s automotive designs. 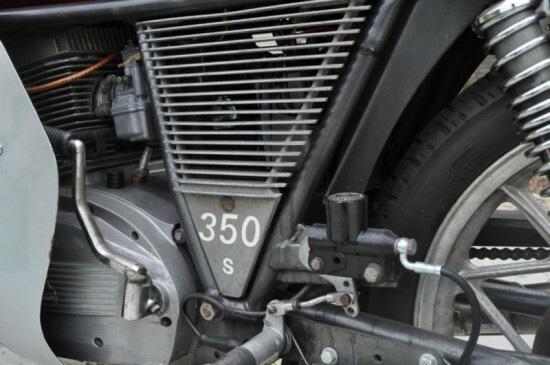 Internally, the bike was largely unchanged from the earlier 350, an air-cooled parallel twin with overhead valves operative via pushrods and rocker arms. Triple discs provided stopping power, a relative rarity among machines of this class. 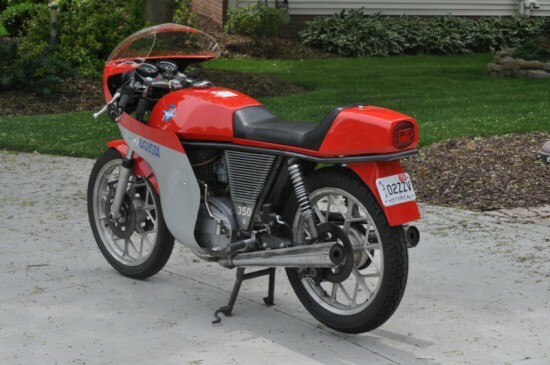 This bike was originally sold in Italy and has just over 10,000 original km (just under 6,300 miles). 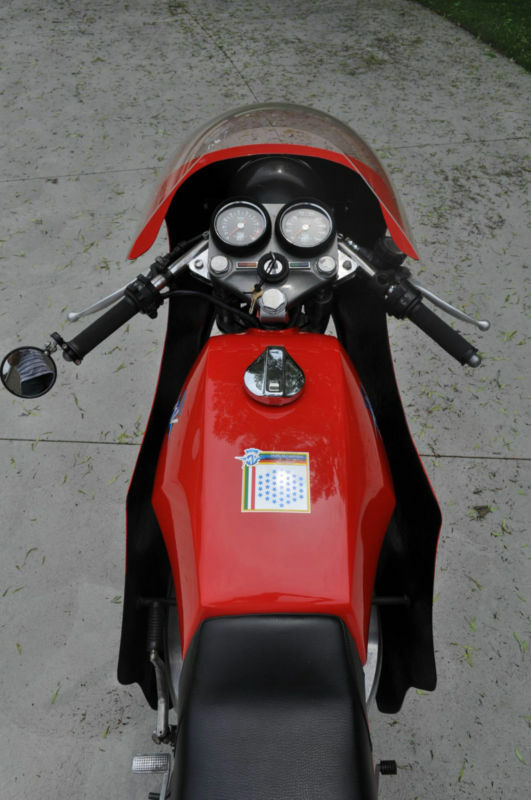 Gary Kohs (former owner of the MV Agusta Collection) purchased this bike on my behalf in Italy in early 2011. The bike comes equipped with the rare, factory fairing. The bike was repainted at some point in its history (tank and body work), but is otherwise completely original and unrestored cosmetically. When the bike arrived, all of the mechanicals were gone through by Stan Lipert of Northern Ohio Ducati (Stan appeared on episodes 10, 11 and 12 of Café Racer on Velocity Channel). He also helpfully lists the work that has been done recently on the bike. He’s asking $10,500 for the privilege of owning this very rare machine. I’ve no idea what these normally go for, as I’ve never seen one before, but the bike looks to be in very good condition, and that seems a pretty small price to pay for such an exotic and interesting bike.